They ended 55-year UWM residency last year, but return for all-Beethoven concert. The Fine Arts Quartet returns to the UW-Milwaukee Zelazo Center this Sunday afternoon to offer an all-Beethoven concert. One year ago the ensemble ended their 55-year residency at the University. The two concerts were sold out. The community response may have been motivated by the expectation that the quartet would dissolve, after a historic 72-year history. Last summer, the ensemble returned for a multi-event festival with community-sponsorship – the result of fund-raising by the Friends of the Fine Arts Quartet in partnership with Saint John’s On The Lake and the UW-Milwaukee Peck School of the Arts. This year, the quartet begins a 2019 season in Milwaukee with the Sunday concert at Zelazo Center. They will return July 14-18 for a three-concert festival. Arts Wisconsin is now a collaborating partner as fiscal receiver for community donations. The Fine Arts Quartet, violinists Ralph Evans and Efim Boico, violist Gil Sharon and cellist Niklas Schmidt, now includes two members who had frequently been guests of the Fine Arts Quartet when a quintet or sextet was required. 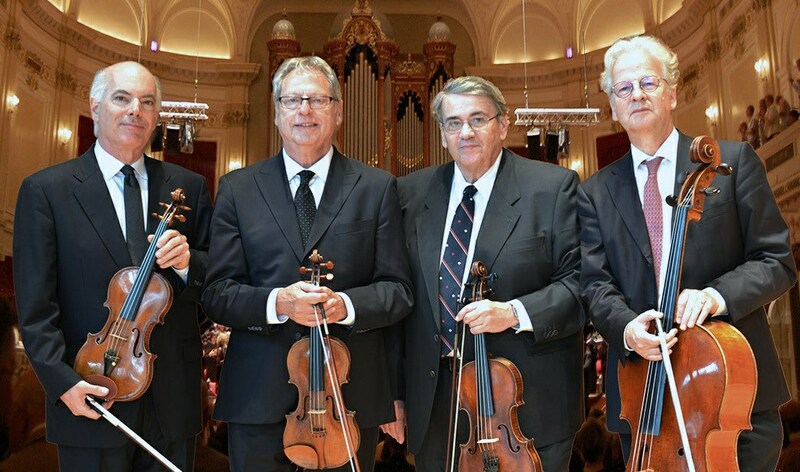 Far from ending, the four began a schedule of concerts in Europe and the United States, with 28 events in 2018 and more than 30 events scheduled for 2019. Sunday’s concert features three works by Ludwig van Beethoven, whose composing career has been measured by substantial evolutionary periods. The Fine Arts Quartet will play one work not published in Beethoven’s lifetime, an exercise prepared while Beethoven was mastering the counterpoint techniques of Johann Sebastian Bach. The Prelude and Fugue for String Quartet in F Major, (Hess 30) closely tracks the sensibilities of Baroque performance in a faithful representation of that era. Beethoven’s ninth quartet, String Quartet in C Major, Op. 59, No. 3 represents his growing independence. In 1805, Beethoven was confronting the severity of his hearing loss. He emerged from deep depression determined to write revolutionary works. Three Opus 59 quartets were premiered in 1807. In a sketchbook containing the quartets, Beethoven asked himself the rhetorical question: “Can anything in the world prevent you from expressing your soul in music?” As he did so, the world of western classical music transitioned from a Classical, formal style to the Romantic era of composition. Last November, Fine Arts Quartet recorded several little-known Beethoven works to contribute to a comprehensive CD box set to be issued by Naxos this spring. The concert serves as an early start to a few years of worldwide celebration of the 250th anniversary of Beethoven’s birth in 1770. Enjoy a bit of music history as one composer’s works reflect Baroque, Classical and Romantic styles. The Fine Arts Quartet performs at the UW-Milwaukee’s Helene Zelazo Center for Performing Arts, 2419 E. Kenwood Blvd. The concert begins at 3:00 p.m. preceded by a pre-talk at 2:00 pm. The concert is free. With open seating, no tickets are required. The Fine Arts Quartet returns for a summer festival on July 14-18. Those concerts will feature several Mozart piano concertos transcribed for piano, string quartet and bass including the world premiere of a transcription of Mozart’s only piano concerto for two pianos.